Welcome to Character Re-Introductions, a spinoff series of my Character Introductions series! While in Character Introductions I interview newly introduced characters to the site, in Character Re-Introductions I interview an already established character who had recently came back to everyone's attention. 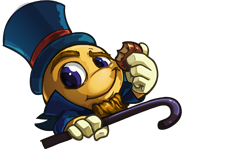 This time I'm interviewing the mysterious owner of Neopia Central’s Chocolate Factory, producer of most of Neopia’s supply of chocolate, and host of the Annual Chocolate Ball: the Chocolate Factory Kiko. As far as everyone could recall the Chocolate Factory had always been around. Not only that, everyone only knows of one owner (yet no one knows his name): the Chocolate Factory Kiko. Actually a few titles have been given to this mysterious Kiko over the years, though all are variations of him being the owner of the Chocolate Factory so we’ll just keep things simple. He’s rather an elusive figure, no workers are seen entering or leaving the Chocolate Factory yet the factory’s store (in its own building separated from the factory) is always freshly stocked. There’s only two times when anyone catches a glimpse of him: sometimes he’ll surprise average Neopians by shopkeeping the chocolate store and if you’re invited to the Annual Chocolate Ball where he appears at the end to handshake and bid farewell to his guests. So, the question is how would I be able to get an interview with him? Sending him a letter is out of the question as many Neopian Times reporters do so and only a very few get a response and I’m more likely to get a million NP from Coltzan’s Shrine before being invited to the Annual Chocolate Ball. That left one option and that’s to wait until he does one of his surprise shopkeeping appearances. My first attempt took just two days, but I hadn’t calculated that everyone else would just be excited to see the Kiko in person (he also apparently gives discounts and free samples). By the time I was able to peel myself off the wall he was gone and the shop returned to its normal procedure: new chocolate stock are moved out via conveyer belts and placed in glass cases where you must enter the NP to buy the item inside (if an item doesn’t sell for a while a trap doors open removing it so the case can be filled by new stock). Well, no more Mr. Nice Reporter! Determined, I set up camp right outside the store ready to stay however long I needed to. But I awoke early next morning to a sound of gates opening. Curious, I peeked out my tent to see the factory’s closed door was open! Seeing my chance, I dashed inside... to find a room with no exit. I tried to leave through the same door but ended up in an even smaller room. Repeat until I was crawling through the same door. Afraid this would keep going till I was crushed, I then found myself walking into an office made from chocolate. However the bizarreness of the situation didn’t dawn on me at the time, for sitting at the desk was the Chocolate Factory Kiko himself! You, my good sir, are late. Did the path I set for you not straight enough? I’m, uh, sorry? I got kind of... lost. I guess you know why I’m here so let’s begin! First I’d like to thank you for the interview, though that brings me to my first question: what is your name? Lost following a straight path? You are a strange one. But we must move on. This interview is 5 minutes late so to get back on schedule let’s skip the first question. Um, Okay. Moving on, can you tell us a little about yourself and the Chocolate Factory? As far as anyone can remember there has always been the Chocolate Factory and you the only owner. Are you the original founder? If not who was or were the previous owner or owners? Excellent! Now we’re back on schedule! Actually we’re now ahead of schedule since you asked three questions. Questions two, three, and four! Do you want to do this interview or not? Sorry, sorry. Okay, so can you tell us about yourself and the Chocolate Factory? *He slams his fist down onto his desk* Do you have any inkling of time?! By this time you should be asking me question three and that was question two! I have a busy schedule and your order of questions is jumping all over it! Right. So this would be the fourth question. So that question was if you were not the original founder who was or were the other owner or owners? Well how do you expect me to answer a question like that without first asking me if I was the original founder? What if I was the original owner, am I suppose to say myself was the previous owner? It makes no sense. So were you the original founder? *He starts to rub his eyes in frustration* We are two questions past question three. Obviously you either cannot or do not care about time and the schedule of others. So I will make this simple as I can, course you couldn’t even follow a straight path but alas. Your next question should be question six. ... How do you decide your guests for the Annual Chocolate Ball? *A giant smile comes across his face* By Fyora, he can keep on track! To finally answer a question, who is invited to my Annual Chocolate Ball is based on a point system. While I can’t tell you how the points are calculated, I can tell you that points are gained by one’s participation within the chocolate lover’s community. How much and what kinds of chocolate they’ve eaten, their accomplishments toward chocolate causes, and other criteria to prove that they are a true chocolate lover deserving to attend the premier chocolate event of the year. Makes sense, if not a bit creepy. Any last words for readers? Not creepy at all, all guests usually buy their chocolate via credit and the accomplishments are reported on by the Neopian Times. It’s all numbers at the end of the day. As for any last words to the readers, just remember what I could have taught you. Following your dreams is admirable but you must put the work to make it possible. Had I been able to answer question two this message would become all the more apparent. Is that the last question? Well I do leave some room at the end to go back to any questions that weren’t answered. *He jumps out of his chair and violently grabs his hat and cane so hard it breaks the chocolate hat stand* GO BACK?! GO BACK!? If we go back to question one we’ll be thirty five minutes late, go back to question two we’ll be thirty minutes late, or question three we’ll be twenty five minutes late! No matter which question we go back to we have gone over time! I expect you to know your way back, I would lead you the way out but I must really get going and it’s in the opposite direction. And that ends this edition of Character Re-Introductions! Who would have thought that such a reclusive Kiko would cause such zealous and sometimes vitriol responses? Then again, considering my experience interviewing him, I can see why. For someone who provides Neopia with the sweetest of treats, he may have a bitter side and I’m not talking about dark chocolate. 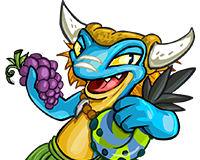 So whether this got your sweet tooth humming or deciding to find an alternate treat (wild guess, but I think Quinton would suggest a fruit), I’ll see you next Character Re-Introductions for the inside scoop.